On 2 Oct 2018, UNU-IAS and the Japan Committee for the International Union for Conservation of Nature (IUCN-J) co-organized a symposium to commemorate IUCN’s 70th anniversary. In the first session, Masato Yoshida, Professor at the University of Tsukuba and co-delegate of the IUCN-J 2020 preparation meeting, explained the history of IUCN and introduced the tools and frameworks they have developed over the past 70 years. Following his presentation, Toshio Torii, Councilor of Ministry of the Environment, Japan, and Mr. Hiroshi Ishihara, Chairman of the Planning Committee of the Keidanren Committee on Nature Conservation, exchanged views and ideas on what IUCN has achieved in Japan and how it can contribute to promotion of the SDGs. 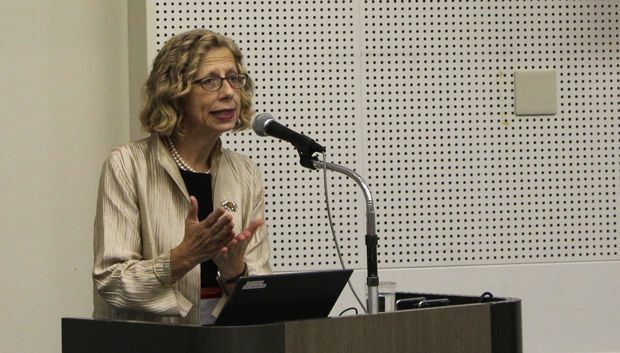 At the beginning of the second session, Inger Andersen, Director General of IUCN, gave a speech on nature-based solutions for the SDGs and the work of IUCN. She explained that although nature is under constant threat due to human actions, our efforts for nature conservation can have clear positive impacts. Andersen emphasized that nature-based solutions are a cost-effective approach to achieving the SDGs as they contribute to resilience, biodiversity, and a better environment for future generations. She also proposed that we should consider investing in nature infrastructure as the seeds of growth for more secure lives in the future. In a panel discussion, Hiromi Masuda, UNU-IAS Programme Coordinator, joined as a panelist and gave a presentation on the Governance for Sustainable Development project. She introduced various activities and forms of partnership to achieve the SDGs at the global, regional, national and subnational levels. She also highlighted the importance of building partnerships, citing the Future City Initiative and its positive impacts. After presentations were given by each panelist, active discussion took place how to develop partnerships with stakeholders. Panelists and participants shared ideas and examples of collaborating with diverse sectors as well as localizing the SDGs. Developing effective outreach strategies to enhance awareness of IUCN and the SDGs was also raised as a topic, and participants and speakers exchanged their views on raising public awareness and engaging wider range of people in more attractive and appealing ways.